MIAMI - A Miami caregiver was arrested Monday after police said she kicked her 93-year-old client when the woman fell off her bed. The assault was captured by a security camera set up inside the victim's bedroom. Martha Diaz Sanchez, 64, faces several charges, including aggravated battery on a person 65 or older. Family members told police that Diaz Sanchez was hired about two weeks ago to serve as a live-in caregiver at victim's home in the 1200 block of Southwest 29th Avenue in the city's Little Havana neighborhood. 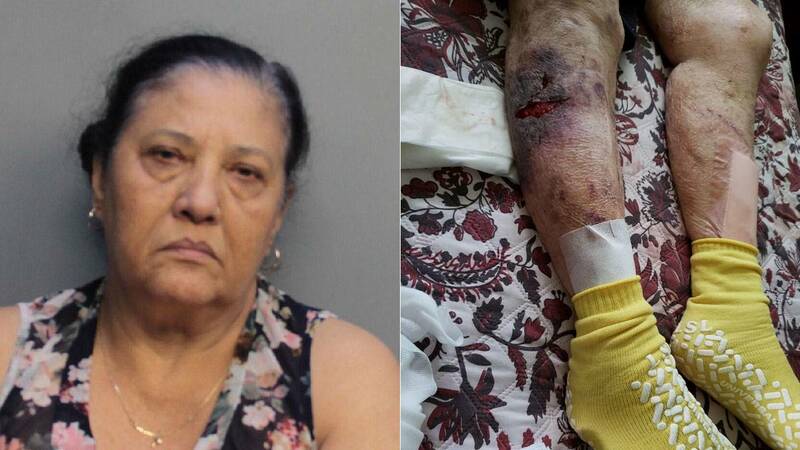 Caretaker Martha Diaz Sanchez (left) is accused of abusing a 93-year-old client (right). After Diaz Sanchez told the victim's daughter that her mother had fallen out of the bed over the weekend, the family reviewed the video from the bedroom camera and saw Diaz Sanchez had kicked the victim after she had fallen, police said. The victim suffered a cut to her right leg in the assault, police said. The video then shows Diaz Sanchez putting the victim back into bed, cleaning blood from the floor with a mop and applying a bandage to the woman's leg. "In a case like this, we’re very happy that the victim did have surveillance footage inside that bedroom. Had she not, God knows what could have ended up happening," said Kiara Delva, a spokeswoman for the Miami Police Department. Paramedics transported Diaz Sanchez to Jackson Memorial Hospital after she complained of chest pains. She was later released and transferred to jail. Diaz Sanchez is currently being held on $35,000 bond at Miami-Dade County's Turner Guilford Knight Correctional Center. "We all have parents, grandparents who don’t have the ability to care for themselves," Delva said. "The last thing we need is for this to be even tolerated."